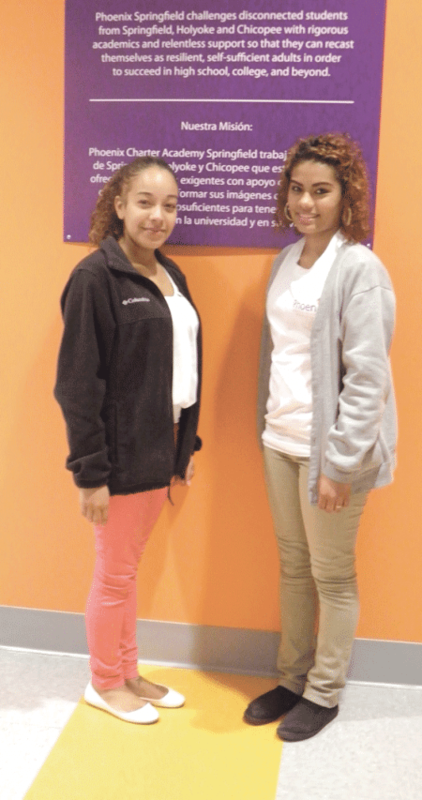 Angela Gonzalez and Eboni Lopez say Phoenix Academy Charter School in Springfield has helped them become successful. Kayliana De La Cruz was quite candid as she talked about what her freshman year of school was like at Commerce High School. Her attitude was reflected in her academic track record: she missed 100 out of 180 days and received horrible grades. “They kept me putting me in credit recovery, which meant sitting in front of a computer, and I just didn’t care,” she recalled. Everything changed when a representative from Phoenix Academy Public Charter High School in Springfield gave a presentation at Commerce and her guidance counselor suggested she fill out an application. She took the advice, albeit reluctantly. And although she initially found the stringent rules at Phoenix “really annoying,” today De La Cruz is — in her opinion and that of those around her — a much different person. The transformation — very much still in progress — results from a combination of small classes, endless support, and the feeling of family generated within the school, which has has broken through her barriers and motivated her to succeed. “Phoenix is a place where people rise from the ashes and get the chance to start again,” she told BusinessWest, as she wiped tears from her eyes and spoke about the help and personal attention that have led to her laudatory achievements. “I’m a little softie now. I am doing really well. I’m running for student president, and I help a lot of other students,” she explained. “Everything is just coming naturally now. 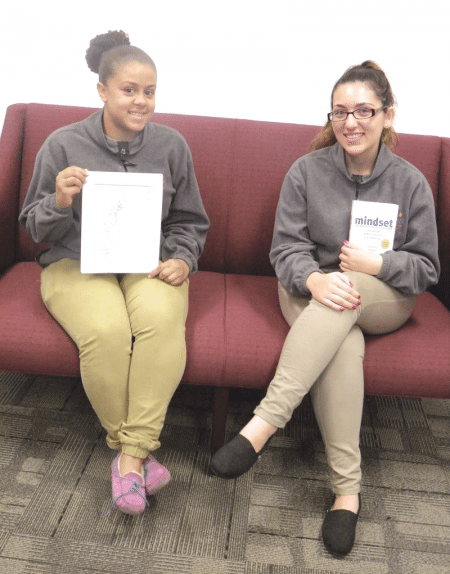 The teen’s high praise is mirrored in stories from other students who told BusinessWest they felt like failures and were ready to drop out before they found a safety net in the new downtown charter school, located within the Technology Park at Springfield Technical Community College. “Our mission is to challenge students with rigorous academics and relentless support so they can recast themselves as resilient, self-sufficient adults in order to succeed in high school and beyond,” said Head of School Mickey Buhl. He said the key to the school’s success is not just small classes, but the multi-faceted support and encouragement students receive from teachers so dedicated that many are there until 7 p.m. each night helping young people master their assignments. “Their economic futures would be bleak without a high-school diploma, and our school creates an opportunity for them to move into a middle-class life; it’s our reason for being,” he said, adding that students cannot graduate from Phoenix until they have a letter of acceptance to a college, and groups have been taken to visit Boston University, Salem State University, UConn, Yale, and other institutions of secondary learning. For this issue and its focus on education, BusinessWest goes inside the recently constructed walls of this unique facility to discover the reasons for its success and why it is worthy of the name on the door. The charter school, which opened its doors in September 2014 in temporary quarters, is part of the Phoenix network. Its first school was founded a decade ago in Chelsea; the second was an alternative public high school in Lawrence, which Phoenix was asked to run when the town went into receivership; and the third is its Springfield location, which serves students in Springfield, Chicopee, and Holyoke. Students wear uniforms and are given a free Pioneer Valley Transit Authority bus pass to get to school, where the day runs from 9 a.m. to 5 p.m., with the exception of Fridays, when the hours are 9 a.m. to 1 p.m. He noted that many of these ‘scholars,’ which is the name given to all students, either left school or planned to due to continued failure and frustration. Operations Director Angela Gonzalez is a graduate of Phoenix’s flagship school in Chelsea. She did well as a public high-school freshman, but lost interest in her sophomore year. Her mother was extremely strict, and once she discovered she could leave school or skip it entirely and they wouldn’t call her home, she began taking advantage of the newfound freedom. That changed when a truant officer saw the teen on the streets. When she was taken back to school, she was told she would have to repeat the year because she had been absent 75 times, which meant she wouldn’t graduate with her class. Gonzalez was referred to, and signed up for, Phoenix Academy, and although she had no plans to attend classes, a school official came to her house if she didn’t show up to change that equation. “My mother would send him into my bedroom, and he told me I had 20 minutes to get up and get ready. And it worked,” she said, adding that the support she received and the knowledge that people cared so much about her was inspiring. 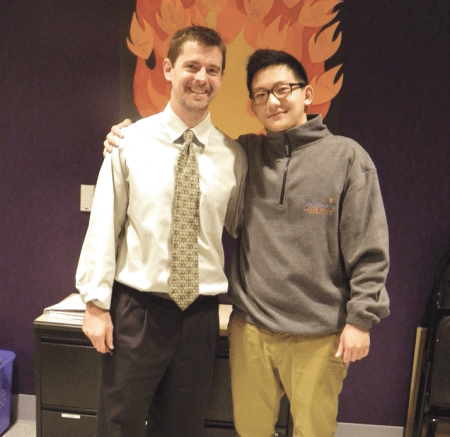 Mickey Buhl and Corey Yang say the support and personal attention scholars receive at Phoenix inspire them to achieve more than they thought possible. “I could sit with the principal at lunch and share how I felt,” Gonzalez said, adding that the school’s leader was instrumental in keeping her on track when she got pregnant during January of her senior year. “I thought I had ruined my life, but there was never any judgment — it was all about moving forward,” she recalled, adding that she is happy to be working at Phoenix, where she can give other students the same encouragement she enjoyed. The school has a no-excuses policy, and Buhl said the staff has very high academic expectations. “We need the students to establish a new image and think of themselves as scholars,” he told BusinessWest, adding that society has labeled his students failures, and they feel that way when they arrive. To meet that goal, classes are kept small by design, and many students stay after school for extra help. In addition, there is a voluntary Saturday session established by a teacher who conducts the sessions without pay. For example, many conduct home visits, even though it’s not required, and some go to appointments with students that range from court to counseling, while others take students shopping. Community support also plays heavily into the equation. They include organizations like the Young Parenting Program, the Department of Youth Services — some students are on probation or involved with the court system — and Springfield Public Schools. The latter works with Phoenix very effectively, and guidance counselors and principals frequently refer parents and their teens to the charter school. Healthy Families is another nonprofit that connects with teachers and staff to coordinate services such as counseling, home support, and transportation. And the school has received a tremendous amount of help from STCC and the Technology Park. “They’re a big reason why we are here; they wanted a school in this building, and the Technology Park has been integrally involved in our development,” Buhl said, explaining that, when Phoenix opened last year, classes were housed in a variety of rooms in the park while a building was renovated for it. The school was completed in time for a September opening and includes its own day-care center, which is important because many students drop out because they get pregnant and have no one to watch their baby or children. “We call it the Little Scholar Center,” Buhl said, adding that everyone in the school — staff, students, and the little scholars (if their parents choose) eat lunch together at the same time, which allows them to form close relationships. Americorps volunteers also spend time at the school, tutoring students for the MCAS exams. And although staff members understand that the young people they are working with have a wide range of experiences, which can include being expelled or suspended from other schools, standards are rigid, and no exceptions are made. On a recent day, Anaeishly De Jesus sat in the principal’s office and proudly pulled an exam out of her book bag. It’s a far cry from where De Jesus was when she started at Phoenix; she cried bitter tears when she was told she was being sent to the charter school. Anaeishly De Jesus and Kayliana De La Cruz say they are doing well in school thanks to the second chance Phoenix offered. That changed as soon as she sat down in her first class at Phoenix. She felt comfortable and said the support since that time has been amazing. “If I do something bad, they don’t throw it in my face,” De Jesus noted, explaining, however, that students get demerits for things like chewing gum, having their phone out, or cursing. To her astonishment, she was able to follow the teacher’s instructions and completed the assignment. The belief that students can and will change if they are repeatedly encouraged and given another chance to do well is exemplified by Eboni Lopez, who transferred to Phoenix from Commerce High School. “I used to skip classes, skip school, and was hanging out with the wrong crowd,” she said, adding she was going through some difficult life situations, which included being bullied. She attended classes at Phoenix last year but remained unmotivated. However, this year, the 17-year-old has set ambitious goals for herself. “I didn’t want to be here when I was 20, and knew I needed to change, so I put my foot down. I’m getting good grades, and my attendance is good now, too,” she said, adding that she is looking forward to graduating next year, enjoys playing soccer at school, and is interested in a career as an athletic trainer. Corey Yang also attended Commerce before starting at Phoenix in September. At Commerce, he said, he was frustrated because he wasn’t making any progress and his teachers weren’t offering him extra help, even though he needed and wanted it. The teen felt alone and unsupported, so he left school early each day or skipped it entirely, and was failing as a result. “I like learning new things, but I wasn’t getting anything out of school,” he told BusinessWest. But that has changed since he entered Phoenix. “I’ve met new people and am working hard,” he said, noting that he has attended the Saturday sessions because the teacher is a former wrestling coach and sets aside time for teens to wrestle under his supervision if they choose to do so, which Yang enjoys. “I wanted to change and start trying; I wanted to see what would happen if I pushed myself,” he said. And he has done exactly that, thanks to unprecedented support. “People want to help me with my work here and will also help get me into college,” the 16-year-old said, adding that his goal is to study computer engineering after graduation. Last year, Phoenix accepted 125 students. This year, it has 175, and next year, it plans to accept 250 young people who need and want a second chance. It’s a place where encouragement never ends. Twice a week there is a community meeting with the entire school body, and students and staff give each other shout-outs, recognize each other’s work with beads, and even publicly choose to apologize for inappropriate behaviors.